It has been less than four months since the U.S. Supreme Court redefined the state of sports betting in the country by voiding the Professional and Amateur Sports Protection Act of 1992, and now, for the first time since this paradigm shift, we are on the verge of the start of an NFL season. The Meadowlands Racetrack — by far the biggest per-day player so far in the racetrack/casino competition so far — looked on Tuesday like a venue scrambling to put on its best face for its coming guests. 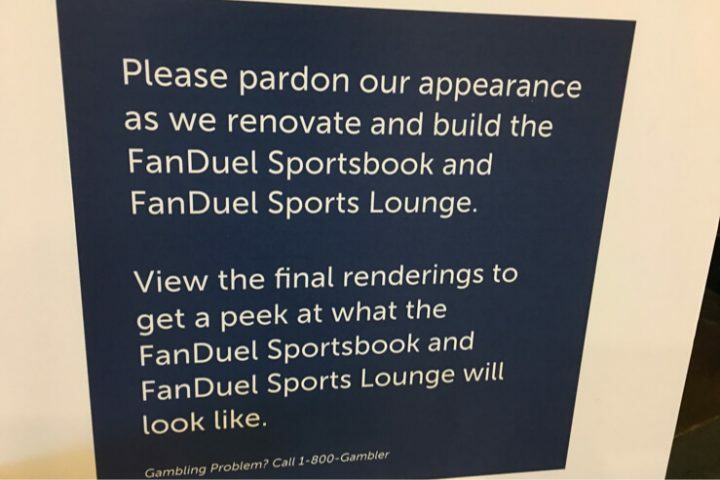 The FanDuel Sportsbook, formerly the Victory NightClub and Sports Bar, was undergoing renovations, so only a front area with four tellers was accessible. The alternative was a temporary “Sports Lounge” on the second floor that was accessible via an escalator near the sportsbook. But I’m told that by Friday — or Thursday night, which would be better since the Eagles and Falcons kick off the NFL season that night — the new look will be in place. Look for 10 betting windows at the sportsbook and five more at another location in the simulcasting area (to the right of the front entrance area). Fall football Sundays at the Meadowlands are a different beast than all other days. On those days, the sportsbook basically is just open to cater to Giants or Jets fans. You need a $35 parking pass to get into the Meadowlands Sports Complex, unless you take a train from Secaucus Junction. If you do the latter, keep in mind that the train service focuses on getting Giants or Jets fans (Giants, in this case, as they face Jacksonville) to and from MetLife Stadium. So while you can take a train as early as 9:30 a.m., don’t expect to be able to watch the late-afternoon Cowboys game at FanDuel Sportsbook and then find a train available at 7:30 p.m. or later. There is bus service to the Meadowlands Racetrack, but it doesn’t run from two hours before a football game until an hour after the game. And again, watching the Cowboys game to the finish could leave you settling for an expensive Uber or Lyft ride back to midtown Manhattan. The story will be far different on Monday night, when the Jets visit Detroit for the start of the Sam Darnold Era. The new quarterback has Jets fans in a frenzy, and expect plenty of them to descend on the FanDuel Sportsbook. That will draw a quizzical eye from the simulcasting “lifers” at the Meadowlands Racetrack, many of whom were on hand when the original grandstand opened to a crowd of 40,000-plus on Sept. 1, 1976. But from the dual betting areas to the overflow option of the second-floor lounge area if things get dicey, there’s a good chance the track will be able to handle Monday’s enthusiastic crowd.